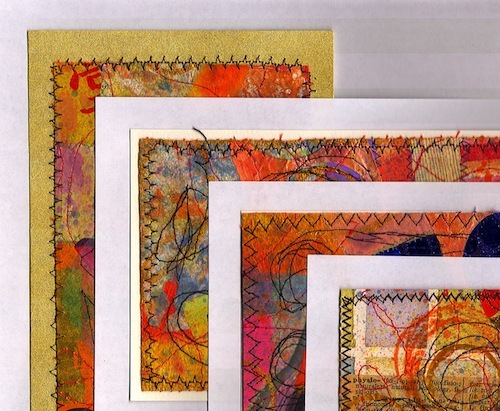 Remember these paper/fabric collage post cards I made recently? I decided to spend a little time this weekend finishing them up--in an effort to reduce the number of unfinished projects hanging around. I thought I would just sew them onto some watercolor paper and be done with it. Of course, it wasn't quite that easy. 1. First I fused the card to watercolor paper and used a zig zag stitch around the card twice. Yuck...HATE IT! 2. I changed the stitch and liked it only slightly better but hated the way it looked on the reverse side of the post card. 3. I changed the stitch again and sewed around the card first before fusing it to the watercolor paper leaving a small white border. I liked this a little better but thought it would be more interesting if the stitch attached the post card to the background. ...when I remembered some black mattes that I found ridiculously cheap at the close-out store about six months ago. So ridiculous in fact that I bought up every package they had. There were a few other colors, but black is classic, right? I took the cards where I didn't like the stitching I had done and put them behind the black mattes. Problem solved! Now I can call them mixed media collage ready for framing. They look great. It's always good to have a Plan B.